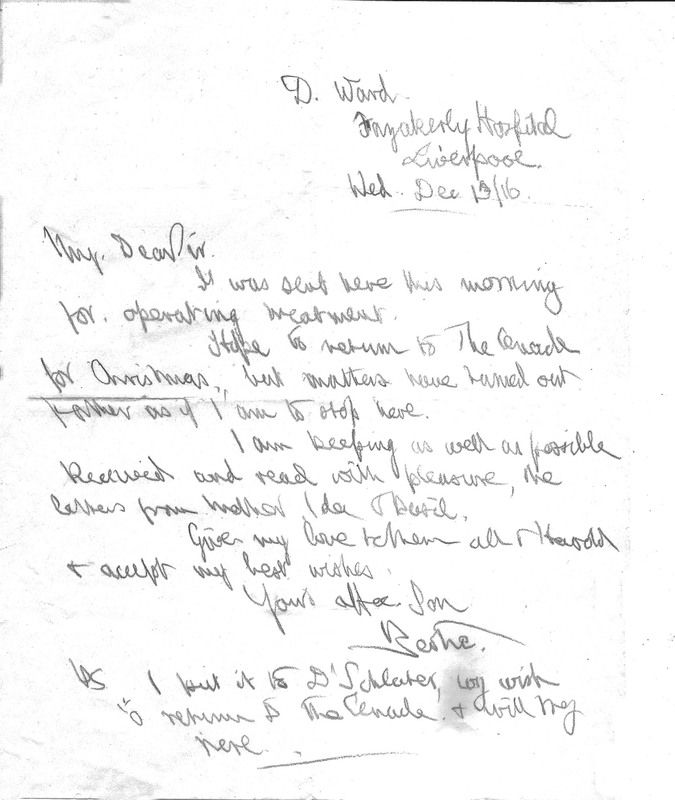 13TH DEC.1916: SENT TO FAZAKERLEY HOSPITAL ‘FOR OPERATING TREATMENT’. Pte BERTIE HIBBETT, D Ward, Fazakerley Hospital, Liverpool (1) : LETTER to ARTHUR HIBBETT Esq. Foden Rd Walsall, Staffs. (2). I was sent here this morning for operating treatment. Hope to return to the The Cenacle for Christmas, but matters have turned out rather as if I am to stop here. I am keeping as well as possible. Received and read with pleasure, the letter from Mother, Ida & Basil. PS I put it to Dr Schlater (sic) my wish to return to the Cenacle & will try here. Pte Bertie Hibbett always conveys important news first to his Father: this time it’s about an operation to save the use of his right hand if not his arm – something that might send him back to the Front or affect his future career. My poor Dad! longing to be Home for Christmas – or if not Home then back with the kind nurses at The Cenacle Hospital. 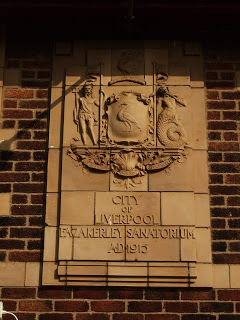 (1) Fazakerley Military Hospital, Liverpool. ‘1st Western Military Hospital‘ in 1914 for treatment of injured soldiers. Hospital built 1903 in grounds of Harbreck Estate, 4.7 miles from Cenacle, New Brighton, across the Mersey. (NB Pte Bertie misspells his address). Fazakerley Hospital . Plaque reads: ‘God has given this peace to us‘. Harbreck Estate bought by City Council, 1898. consisted of a Country House, farms and cottages. By 1906 the Hospital had 4 isolation blocks for infectious diseases (smallpox & TB), a nurses’ home/admin block/kitchen block/laundry/dispensary/ mortuary. Fazakerley Sanatorium (245 TB patients) opened in 1920 by Alderman Dr. John Utting JP/ a relative of Hibbett Family Doctor in Walsall perhaps? Fazakerley district was home to Royal Ordnance Factories making WW1 Lee-Enfield Rifles (Sten & Stirling submachine guns WW2). Fazakerley: Anglo-Saxon ‘a wood or a clearing’. (2) Handwriting appears left-handed, similar to that of Pte Bertie’s first Letter Home from the Somme, 9th July 1916. (3) ‘Schlater’ is German: perhaps changed to Sclater to mask connection with Germany in wartime?) cf Hibbett Letter: 25th Nov. 1916. NEXT POST: 15th Dec. 1916. ‘Every cloud has a silver lining’. Dr J. Utting.Dr Sclater.Fazakerley Hospital Liverpool 1916.Harbreck Estate Liverpool.Writing Left-handed. 10TH DEC. 1916: SOMME PAY: ‘7/- SHILLINGS A WEEK & 15 FRANCS CREDIT BEFORE THE CHARGE’. Pte BERTIE HIBBETT. The Cenacle. B.R.C. Hospital New Brighton Cheshire. LETTER TO BASIL HIBBETT, 95, Foden Rd. Walsall. ‘That ye may abound in hope through the power of the Holy Ghost’. Epistle (1). Of course, I know this letter will be read all round, but is a long time since I addressed a letter to my dear young brother. The Second Sunday in Advent – last year where was I? Most likely you had a letter from me on this day last year. Yes. Well do I remember getting with great delight the letter from Cirencester (3). I believe the letter was dated Dec 8th Wed. Vernon had gone to Hospital & I followed soon after. I wonder if I shall have a chance of seeing Vernon. I hope so and I shall have a chance of seeing you at Home round the Study fire. Dear Basil, I do not really know what to say about receiving your PC sent from Lichfield (4). Did you go there on your own or were you called? When will you have to leave Home? Vernon’s commission seems to be hampered with the continuous illnesses he gets. He is in Hospital at Davenport, I had a letter from him the other night. I hope you have not the slightest symptoms of jaundice now. I hope too that Mother is quite well again. Oh if we could only do something that would keep her well & happy for good. I am sure God never intended things to happen in this world that would make us unhappy for a life time. Everything is for good to those who love Him, who gave his life for us all & rose again that we might live (5). I believe you must have thought quietly that the Almighty has so ordered my return Home for the best. I am not ready, I have not learned yet to live as I ought, I have still more to learn. He called Our Dear Sydney because he was ready to a certain extent. That letter our dear brother wrote, to be handed personally to Mother, has caused me to think greatly. I am sure you will follow his good example of smartness, discipline, cleanliness (6). If he had been a Second Lieutenant, he would I believe not have been able to show his ability of improvement so fast. I am pleased you are taking a commission. You will be able to take the place Sydney unfortunately? missed. You will be able to carry on. I remember how you & Sydney were generally together. I shall not forget the dream of Sydney & we three together & Sydney was taking kindly & brotherly to us. I cannot quite tell you what he said, but I believe he would say something to the effect that you & I will love & take care of each other in future. Yes, you are right, he who dies for England lives, especially nowadays, for we are in the right. Let us stick fast to our true aim – Christian love throughout the world. I have you both in my Locker. ‘Good morning! 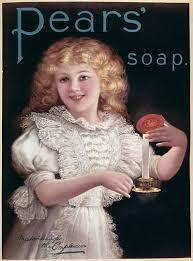 Have you used Pear’s soap?’ (6). I have written a long letter with my left to Harold. My right has gone much better for writing but it is just after dressing that I cannot bear to write. It feels more than ever that bones are jerking & floating about. In case I did not tell you the results of the Xray I will now (7). There is still some diseased bone in. I had some out the other day, about 1/8” and it is as porous as pumice stone. The two holes I mentioned are growing larger & larger & I shouldn’t be surprised if they both meet & form one big hole, then the matter will come out & bring the bone with it. But sorry, my Boy, it looks as if I shall be heading my letters at Christmas in the same old way that I have done these last 5 months. I shall look forward to the little snack of fare you have. I guess you won’t indulge in many luxuries this Xmas but still all the better, and please persuade Mum & the others to withdraw their cash generosity a little more. You’ll make me a money grabber soon. Yes what about that 14 £ – I have not said (8). A quarter master and I have talked over the matter & we came to the conclusion that it is quite likely if Vernon had not received pay from the time he left France till the time he was discharged from Hospital, say about 7 months at 7/- shillings a week what is that? and then add the deficiencies during the time he was on Active Service, amounting to 4 or 5 £ it comes to something about that amount. I should not get the money sent to me here, it will be sent Home. Yes, father is the right person to look after it being obtained. Of course, I shall not get so much. I hope you are not all building up hopes of a Bolt from the Blue. I handed in my pay-book on entry into Hospital & I have a copy of the accounts in Ida’s pocket book. I had 15 francs credit paid to me just before the Charge. I have to shave now of course & I have no razor. If you are thinking of a Christmas present that would be very acceptable. Boots Chemist, Bold Street, Liverpool. 3rd shop left side. courtesy ronramstew blog (Flikr). I am getting on nicely with Christmas cards. I went into Boots in Liverpool, they have a magnificent place there (9), I only wish Dodger was with me to pot round, but let us be satisfied. If you ever write to George Lallerman* (10) just remember me kindly to him. 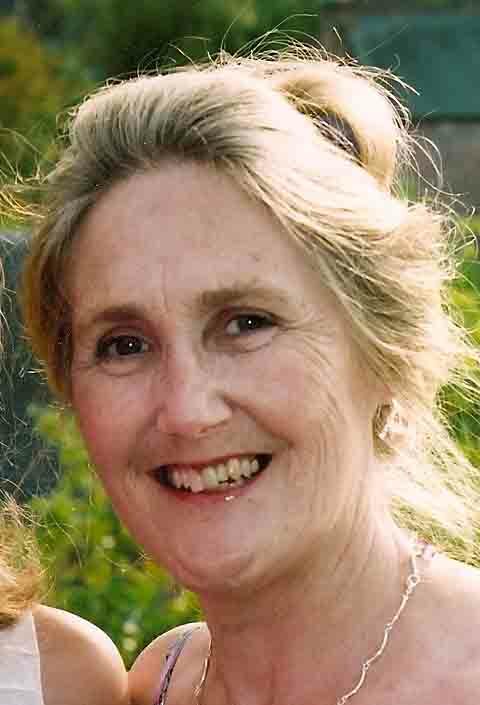 Ida has not written to me if she still needs a photo for to send to Mrs Lallerman. Harold is busy isn’t he, let’s hope we shall witness a happy marriage (11). I am witnessing the one of Nurse Wilcox* on 12th. Her fiancé has come from Uganda & the Nurse was showing me her future home, a bungalow with thatched roof (12). I will conclude on this my ninth page. Trusting you are going to bed, after a Happy Sunday to have pleasant dreams. I guess I will have a letter from dear Mummy or Ida to say you have spent it happily together round the dining room fire. Tell me how you spent the rest of the day at Lichfield. I like the PC you sent. Yes, typical that you are to serve our good King George V who, like a father, called his Council together. It is all Lloyd George round here (13). I knew he would make things lively. Well ta ta. Heaps of Love & kisses to Mother, Sister, Daddie & everyone – & a reverent kiss for Sydney. I remain your loving brother, Bertie. How do you like the aroma of Dad’s pipe? (1) Epistle for 2nd Sunday in Advent, Book of Common Prayer 1662: Romans 15.4. (2) Gospel: Luke 21. 28. Quoting from memory Pte Bertie gives ‘Lift up your heads’ instead of ‘hearts’. (3) Cirencester: Sydney in Hospital there with ‘catarrhal jaundice’. Hibbett Letter: 30th Dec. 1915. (4) Lichfield: Staffordshire Regiment Barracks. Basil had listened to his parents & siblings’ advice to go for a Commission rather than join as a Private. An Officer no doubt had more privileges but a subaltern’s life expectancy at this time was little more than 6 weeks at the Front. (5) Everything is for good to those who Love God: my father is paraphrasing Romans 8.28 King James Version ‘And we know that all things work together for good to them that love God’. (6) Cleanliness in mind & body was the foundation of Baden Powell’s Boy Scouts Movement. ‘Pears Soap’: Pte Bertie had both Sydney & Basil’s smiling photographs in his bedside locker. (7) X-rays of wounded wrist & arm. Hibbett Letters: 25th Dec. 1916. (8) Army Pay. £14 in 1916 amounted to £856.10 but <https://www.measuringworth.com > explains how complicated is calculation of worth/ relative values. 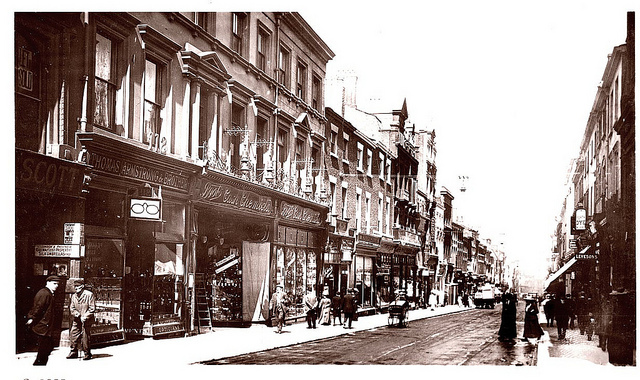 (9) Boots Chemist of Bold Street Liverpool. Postcard 1913. Flickr: ronramstew blog states Bold Street was favoured by middle classes ‘before their big flight to the Wirral’. Building is now a Charity Shop. (10) George Lallerman*: Ida’s childhood friend. (11) Harold married Hildegarde Bore (Hilda) sometime in 1917? 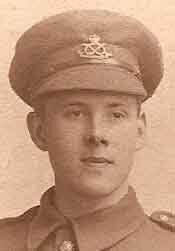 (12) Nurse Wilcox*: her fiance must have been a British soldier in the East African Campaign 3rd Aug. 1914 – November 1918. See Wikipedia. (13) Lloyd George: 1863 -1945. Chancellor of Exchequer 1908–1915. Prime Minister Wartime Coalition Government 1916–22. Major player Versailles/Paris Peace Conference 1919 that reordered Europe after the defeat of Central Powers. Lloyd George ‘arguably made a greater impact on British public life than any other 20th-century leader, thanks to his pre-war introduction of Britain’s social welfare system, his leadership in winning the war, his post-war role in reshaping Europe, and his partitioning Ireland (between Southern Ireland – later the Irish Free State – and Northern Ireland which remained part of the UK). He was the last Liberal to serve as Prime Minister.’ Wikipedia. 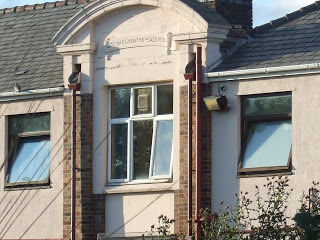 NEXT POST: 13th Dec. 1916: Ward D Fazakerly Hospital Liverpool for operating treatment. Army Pay 1916.Baden-Powell.Boots Chemist Bold Street Liverpool 1916.East African Campaign WW1.Lichfield Staffordshire Barracks 1916.Lloyd George Prime Minister.Pears Soap 1916.Somme Charge Gommecourt 1.7.1916.X-rays Xrays 1916.